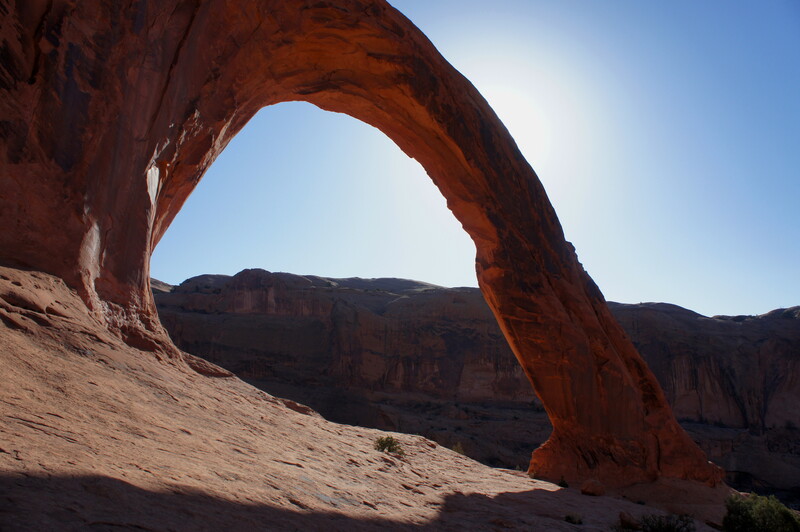 Boasting an aperture of 140 ft. by 105 ft., Corona Arch is one of Utah’s largest—and most spectacular—natural arches. 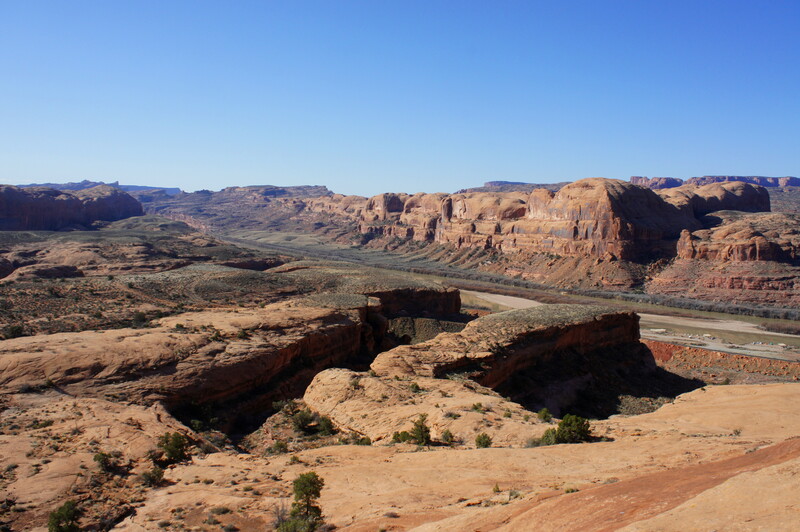 Yet its location, tucked away amidst BLM land, keeps the place relatively unspoiled, in contrast with the swarming crowds of nearby Arches National Park. Corona is situated amidst a seemingly endless sea of slickrock of the Navajo sandstone variety, a landscape that boasts a number of other arches as well, including nearby Bowtie Arch and Pinto Arch. It is possible to see all three spans on a moderately difficult, 2-hour jaunt to and from Highway 279, also known as the Potash Road. 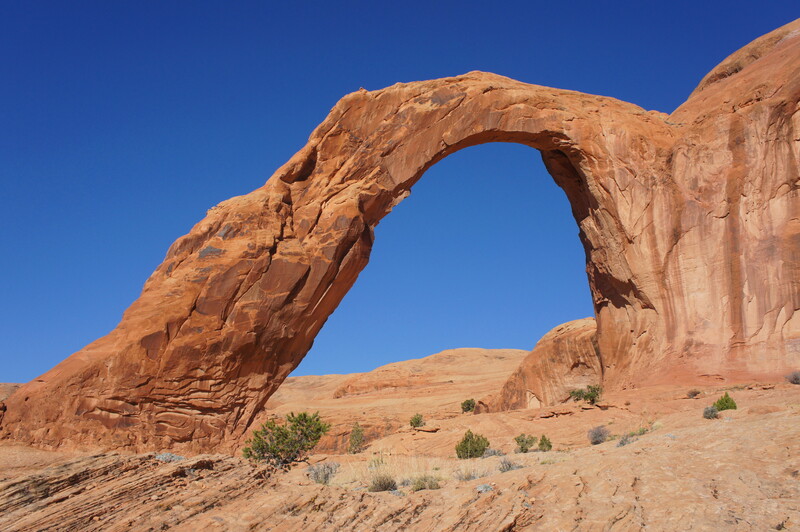 Easiest access to Corona Arch is by way of the self-titled trailhead roughly 10 miles up Route 279 from the intersection with Highway 191 northwest of Moab. 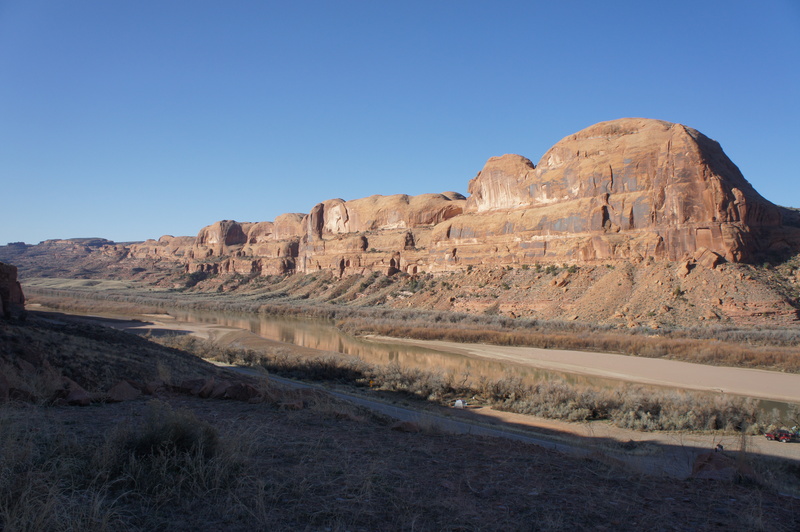 There is a marked parking lot on the right-hand side of the road, opposite the Gold Bar camping area and the Colorado River. The views west from the trailhead itself are majestic, as the Colorado winds around a sharp bend below 500- to 600-foot cliffs of sandstone. Of course, the best is yet to come—and hikers begin working for it immediately as the well-defined trail climbs steadily, rounds a single switchback, then follows an old road bed as it edges north along the canyon wall. Within five minutes, hikers encounter a peculiar sight: a set of steel railroad tracks, still active and operated by Union Pacific. It is apparent to the right that engineers blasted through the sandstone to accommodate passage for locomotives; while leaving it behind for now, you will likely spot the railway again later in the hike. Beyond the tracks, the ever-ascending trail rounds a right-bearing curve and skirts a minor ravine that is quite shaded in the morning. Having gained close to 200 feet in elevation since the trail’s start, the hike flattens out onto a sunny, open expanse populated by sage and the occasional juniper or pinyon pine. To the left, look for the shy opening of Pinto Arch tucked away in a shady corner. 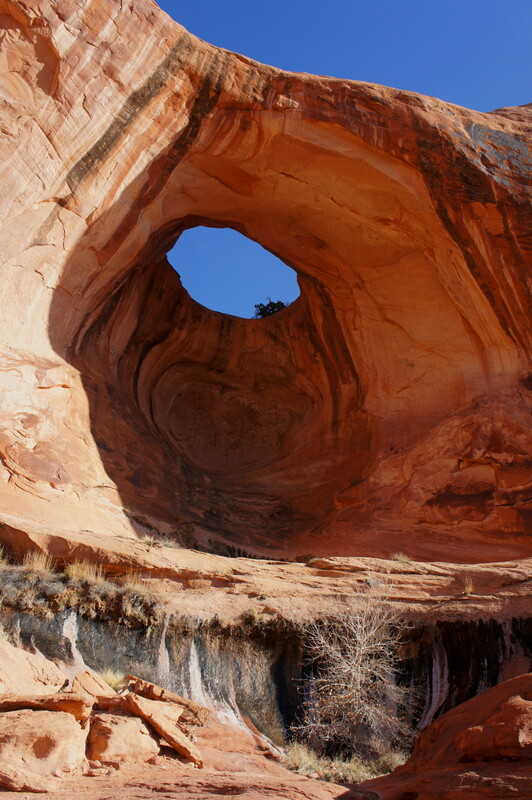 Pinto is a prime example of a “pothole arch”—carved over time where water found a weakness in the sandstone. Reaching the span requires a bit of off-trail navigation—try to avoid cryptobiotic soil!—as well as a Class 3 climb up to a sandstone shelf that could be hairy for some. Immediately below the arch is an appealing alcove, stained with black varnish and scattered with mosses. If time and energy permits, the side hike to Pinto is a worthy endeavor, though it will add as much as a mile to your round trip. 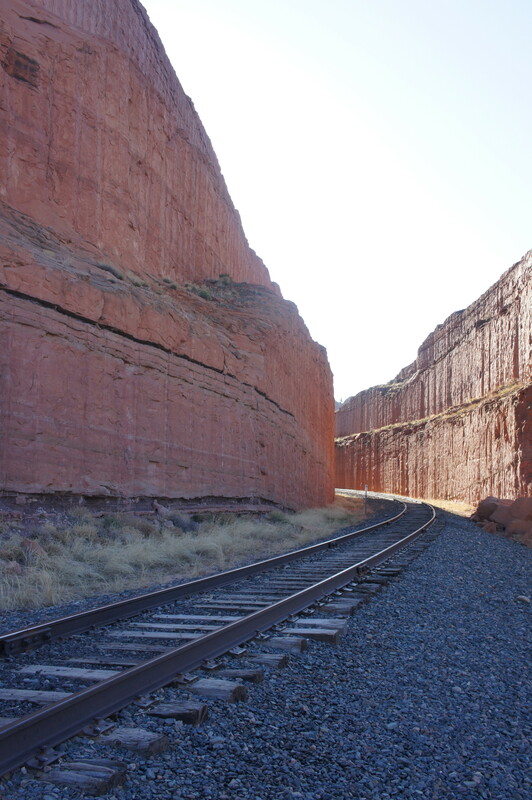 Cutting southeast from Pinto to meet the trail by edging the bottom of the Navajo cliffs is probably more frustrating than simply bearing south to pick up the track again. Back on the main route—marked by well-placed cairns—bear east and north across the open section. 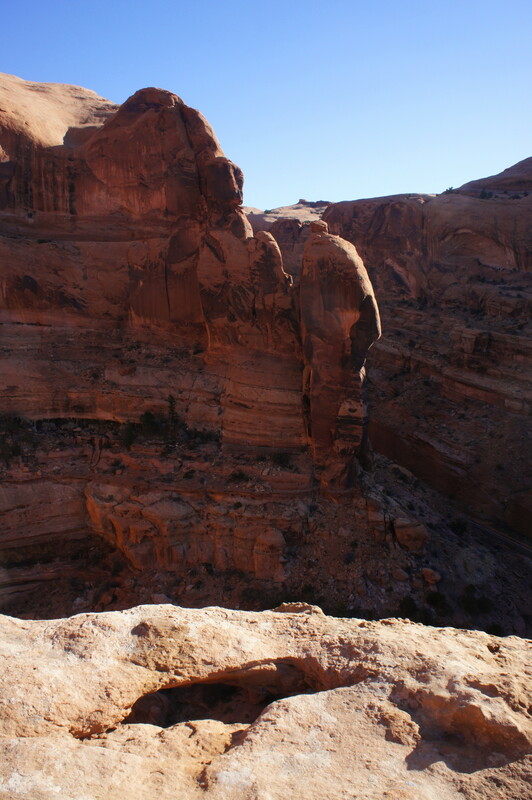 Roughly a mile from the trailhead, dirt gives way to slickrock, and the route skirts around a protruding cliff, revealing the hike’s first view of fantastic Corona Arch ahead. At this point, another half-mile remains to reach the arch, but the sight of the mighty aperture motivates hikers to press on, even in a summer heat. With a deep ravine separating you and the arch, hikers must venture upward to skirt the obstacle. To many visitors’ surprise, this includes a steep but short friction climb assisted by the presence of moki steps and a safety cable. A few steps later, a small ladder facilitates passage up a ledgey pitch. 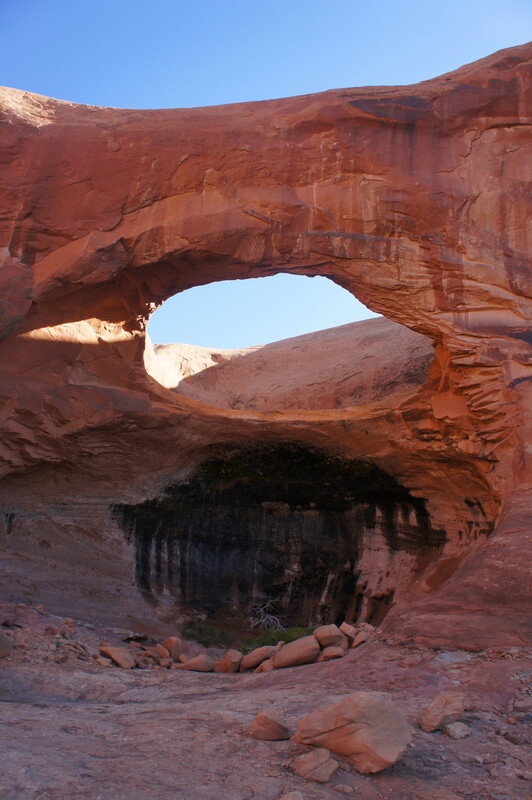 From here, it is relatively smooth to Corona Arch. Don’t forget to look up to the left, however, where Bowtie Arch (another pothole arch) rises high above. Bowtie too is colored by streaks of desert varnish. Corona, of course, is the main event. Colloquially known as “Little Rainbow Bridge,” Corona’s opening is so large that airplanes have flown through it. It’s naturally a popular spot for photographers—note that morning hikers will have to cross under the arch to the east side to avoid dense shadows. To the south, the slickrock slope drops off into Bootlegger Canyon, where the railroad tracks can again be spotted below. From Corona, it is approximately 1.5 miles back to the trailhead. Allot around two hours for the round-trip; add ½-1 hour for the side trip to Pinto Arch. 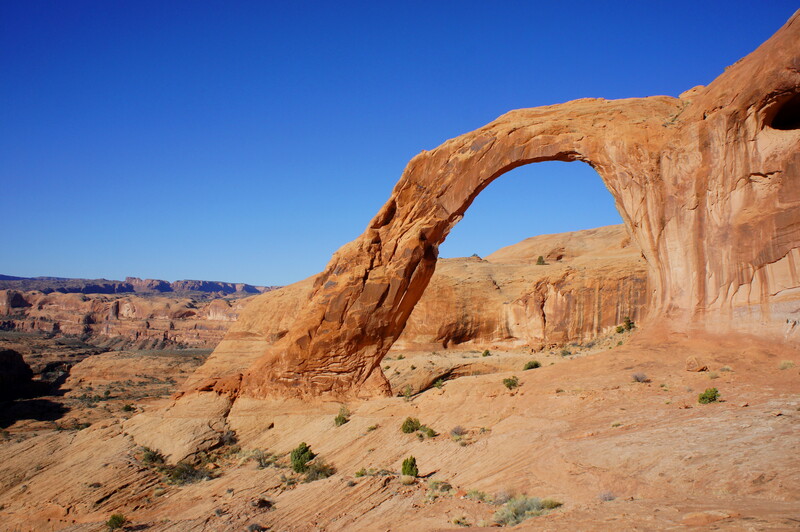 This entry was posted in Moab area, Moderate Hikes, Utah and tagged arch, Bootlegger Canyon, Bowtie Arch, Colorado River, Corona Arch, desert varnish, Highway 279, Moab, Navajo sandstone, Pinto Arch, Potash Road, pothole arch, Utah. Bookmark the permalink. We did this hike for a second time in April. I had read about the Pinto Arch, but we couldn’t find it even with four of us looking. I guess next April we’ll give it another try! Thanks for including the video with the plane going through all those arches…crazy!